Miss E came home from her last day of school with this worksheet in her bag. "Draw a line to match each baby to its parent." So at first, I rolled my eyes, sighed, and then thought about the note I should send to the teacher. Then I thought, it's the last day of school. What's the point of sending a note? And then I decided I was being oversensitive. But now I'm fired up again about it. What is the point of this worksheet? Yes, typically a "cub" matches a "lion." They are the same species. But what is the lesson in all of this? That kids and parents always match? Need to match? What if my kid had drawn a line from the chick to the wolf? Would it have been marked wrong? Even in the animal world, there are some fantastic stories of adoption that take place from animals who do not "match." One of our favorites is Little Pink Pup. So, parents, would this worksheet bother you? What do you think it says about adoption, if anything? Since it's matching species to species it wouldn't bother me. Now if those pictures were people with different skin colors to be matched up that would be something upsetting indeed. Wouldn't it be cool if one of the pictures had been a mom and child (the rest animals) and the mom and child were different colors? I saw a very similar page in a summer bridge workbook. I was horrified. Even though school is over, I would definitely send the teacher a nice note and just let her know why this bothered you. She probably didn't even think about it. But maybe next year she will. As a mom to a gorgeous adopted daughter (who looks nothing like me) and a qualified teacher, I don't think this says anything about adoption. 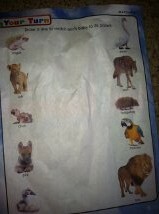 I think the point of the worksheet is to teach the child about animals. Perhaps the teacher could have explained to the class during the lesson how sometimes animals from different species will adopt each other, but I don't see anything upsetting about the worksheet itself (other than that it is a worksheet which is not very creative- but that's a whole discussion on its own!) Besides, my daughter does resemble her biological mother just as the animals resemble theirs.That's not something I want to hide from her or pretend isn't true. As concerned parents, we want the best for our children so I too find myself aware and on the lookout for possible injustices but I believe we must be very careful of putting our own (adult) thoughts and ideas and interpretations onto our children.Quite possibly no harm was done!